After procrastinating for more than an year, I finally gave one of the certifications related to the technology I work in yesterday and I successfully cleared it! It’s been a few years since I spent time studying and the past few days were really tough to go through books, learn and prepare. When I got the score sheet and realized that I cleared, it was such a relief ! So, I just had another reason to request for husband’s briyani this weekend 🙂 He obliged to make his recent super hit Mutton sukka as well. He tried this recipe a couple of weeks ago and it was a hit with a few of our friends to whom we parceled some. He usually looks for recipes online and mix matches to his convenience. Here is the mix-matched Mutton sukka recipe which is very easy to make but tastes more like the Anjappar ones. 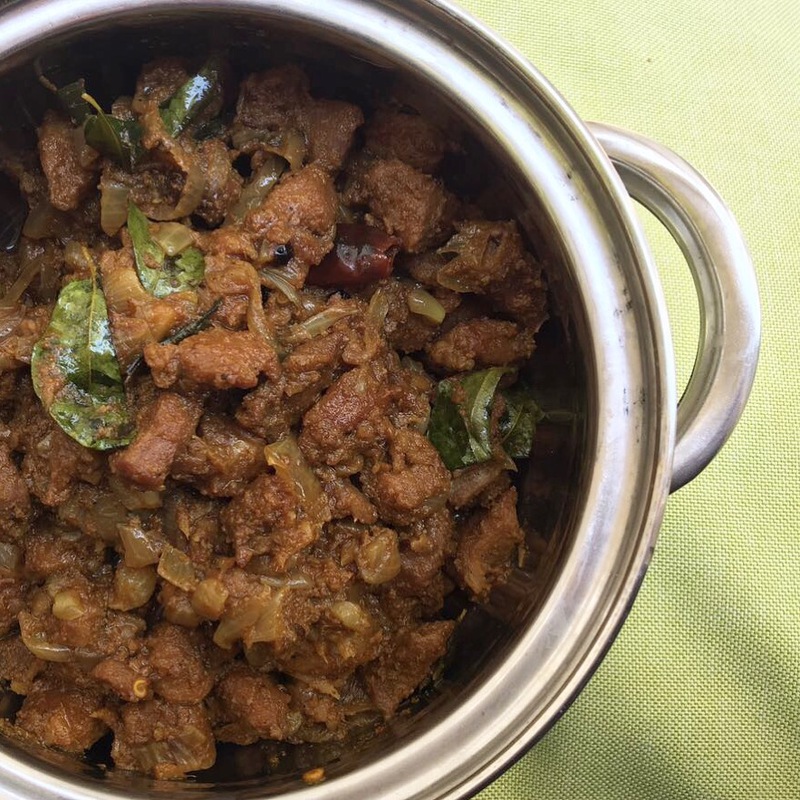 Cut mutton into small bite size pieces and pressure cook for 8-10 whistles along with 1 tbsp of cumin powder, ginger garlic paste, garam masala and salt . Heat a thick bottom kadai and add gingely oil or the normal cooking oil. Add mustard seeds and once they crackle, add the chopped onions and fry them until they turn transparent. Add 1 tbsp of ginger garlic paste and cook until the raw smell goes off. Add one chopped tomato (if using), break the dry chilies into halves and curry leaves and cook until the tomatoes turn mushy. Now start adding the masala powders – red chili powder, coriander powder, remaining garam masala powder,cumin powder, pepper powder and turmeric powder. Add little of the water used to cook the mutton from the pressure cooker and let the masala cook for a couple of minutes. Add the cooked mutton and the remaining water to the masala and cook until the oil separates. If you want the sukka to be more dry, cook for a few more minutes. Serve it with briyani or with rice and mutton curry or rasam ! Please don’t forget to wipe off the kadai with some white rice. The mixture of the left over masala tossed with rice in the kadai is the best part!